Dippin’ Dots, the ice cream of the future, sought an interactive campaign for Q4 that would resonate with their core demographic and drive new excitement. Little did they realize that “something strange was coming to their planet … us!” Realizing a partnership opportunity, matrixx connected Dippin’ Dots with the Sony Pictures new movie launch ‘Planet 51’ staring Dwayne Johnson, Jessica Biel, Justin Long, Seann William Scott, Gary Oldman and John Cleese. As Senior Interactive Producer for matrixx, we came up with the Dippin’ Dots Planet 51 Movie Sweeps! Leveraging the popular Dippin’ Dots Page on Facebook to host the sweeps (currently the #27 page on Facebook), one lucky family won a Trip to Hollywood, CA to the red carpet premiere party for Planet 51. The trip was for 4 people and included airfare and hotel for 3 days/2 nights (drawing on November 4, 2009). Other prizes included a 1-year supply of Dippin’ Dots ice cream (drawing on December 17, 2009) and 30 SEGA Planet 51 video games for either PS3, Xbox 360, Nintendo DS or Wii (drawing approximately each week for two winners). The Dippin’ Dots Page on Facebook contained many engaging elements which included several unique mini-promotions that gave away Dippin ‘ Dots ice cream party-packs, new Dots ‘n Cream ice cream, the new Dippin’ Dots frozen Dot-maker toy, Dippin’ Dots licensed lip balm & lip gloss, a Dippin’ Dots Creative Art Set, downloadable coupons for Dippin’ Dots ice cream (to further drive in-store sales), Space Camp the game for Wii and even FREE mobile wallpaper when you text ‘51’ to 26000 from your mobile phone provided by Planet 51 the movie. 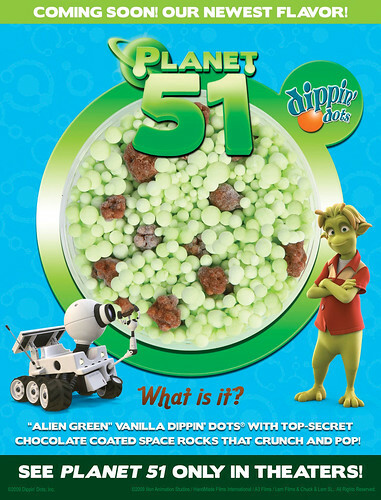 Additionally, Dippin’ Dots came out with a new ice cream flavor – Planet 51 ice cream! “Alien Green” vanilla Dippin’ Dots with top-secret space rocks that crunch and pop! (most definitely my favorite ice cream flavor all-time) was a huge hit with the Franchisees and Sony as well as everyone else involved in the campaign. The campaign began on September 11, 2009 and ends December 16, 2009. So far the campaign has been a huge success generating millions of branded user engagements across the board and encouraging tens of thousands of new members to join the Dippin’ Dots 0/40 e-Club. None of this could have been possible without the creative designs Scott Salchli from Dippin’ Dots and Al Morales from matrixx, as well as the helpful planning and superior campaign management from Erin Brown. Thanks for a really great campaign you guys!